Only Reliable Equipment Sales offers these Wilden pump parts kits pre-packaged to suit dozens of different Wilden diaphragm pumps in a choice of materials, in stock and ready to ship. 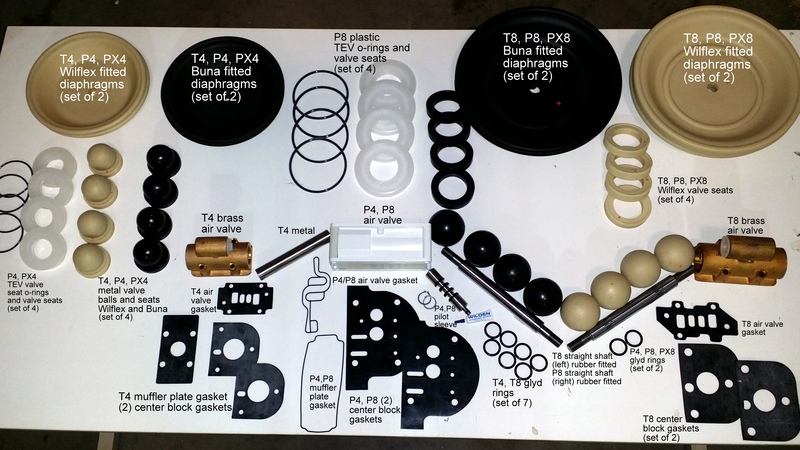 For individual AODD pump diaphragms, gaskets, valve balls and other parts, call 203-740-1877. Wilden 1-inch T Series Metal Pump Kits feature genuine Wilden parts. Choose the standard repair kit with diaphragms, valve balls, valve seat o-rings and more or select a series of upgrades for superior performance and extended service life. For free guidance on selecting the ideal kit, call or chat! Wilden 1-inch P Series Metal Pump Kits feature genuine Wilden parts. Choose the standard repair kit with diaphragms, pilot sleeve assembly, valve balls, valve seat o-rings and more or select a series of upgrades for superior performance and extended service life. For free guidance on selecting the ideal kit, call or chat! Wilden 1-inch P Series Plastic Pump Kits feature genuine Wilden parts. Choose the standard repair kit with diaphragms, pilot sleeve assembly, valve balls and more or select a series of upgrades for superior performance and extended service life. For free guidance on selecting the ideal kit, call or chat! Wilden 1.5-inch T4 Series Metal Pump Kits feature genuine Wilden parts. Choose the standard repair kit with diaphragms, shaft glyd rings, valve balls, valve seat o-rings and more or select a series of upgrades for superior performance and extended service life. For free guidance on selecting the ideal kit, call or chat! Wilden 1.5-inch P4 Series Metal Pump Kits feature genuine Wilden parts. Choose the standard repair kit with diaphragms, pilot sleeve assembly, valve balls, valve seat o-rings and more or select a series of upgrades for superior performance and extended service life. For free guidance on selecting the ideal kit, call or chat! Wilden 1.5-inch P4 Series Plastic Pump Kits feature genuine Wilden parts. Choose the standard repair kit with diaphragms, pilot sleeve assembly, valve balls, valve seat o-rings and more or select a series of upgrades for superior performance and extended service life. For free guidance on selecting the ideal kit, call or chat! Wilden 1.5-inch PX4 Series Metal Pump Kits feature genuine Wilden parts. Choose the standard repair kit with diaphragms, pilot sleeve assembly, valve balls, valve seat o-rings and more or select a series of upgrades for superior performance and extended service life. For free guidance on selecting the ideal kit, call or chat! Wilden 1.5-inch PX4 Series Plastic Pump Kits feature genuine Wilden parts. Choose the standard repair kit with diaphragms, pilot sleeve assembly, valve balls and more or select a series of upgrades for superior performance and extended service life. For free guidance on selecting the ideal kit, call or chat! Wilden 2-inch T8 Series Metal Pump Kits feature genuine Wilden parts. Choose the standard repair kit with diaphragms, valve seats, valve balls, valve seat o-rings and more or select a series of upgrades for superior performance and extended service life. For free guidance on selecting the ideal kit, call or chat! Wilden 2-inch P8 Series Metal Pump Kits feature genuine Wilden parts. Choose the standard repair kit with diaphragms, pilot sleeve assembly, valve balls, valve seat o-rings and more or select a series of upgrades for superior performance and extended service life. For free guidance on selecting the ideal kit, call or chat! Wilden 2-inch P8 Series Plastic Pump Kits feature genuine Wilden parts. Choose the standard repair kit with diaphragms, pilot sleeve assembly, valve balls, valve seat o-rings and more or select a series of upgrades for superior performance and extended service life. For free guidance on selecting the ideal kit, call or chat! Wilden 2-inch PX8 Series Metal Pump Kits feature genuine Wilden parts. Choose the standard repair kit with diaphragms, pilot sleeve assembly, valve balls, valve seat o-rings and more or select a series of upgrades for superior performance and extended service life. For free guidance on selecting the ideal kit, call or chat! Wilden 2-inch PX8 Series Plastic Pump Kits feature genuine Wilden parts. Choose the standard repair kit with diaphragms, pilot sleeve assembly, valve balls, valve seat o-rings and more or select a series of upgrades for superior performance and extended service life. For free guidance on selecting the ideal kit, call or chat!